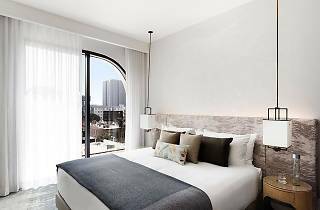 Located in a revitalized pocket of Cahuenga Boulevard, the trendy hotel chain’s first West Coast outpost is as Hollywood as it gets. From an Insta-friendly mural by elusive graffiti artist Mr. Brainwash to a rooftop pool that doubles as a dance floor, it’s a dream come true (pun intended). 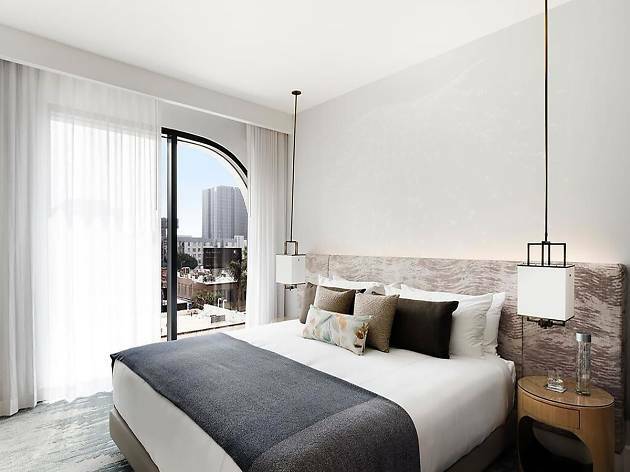 Lap up the Hollywood lifestyle at this vibrant hotel situated minutes from Grauman’s Chinese Theatre and the Walk of Fame. Those landmarks might be close, but guests aren’t here for the touristy stuff. It’s the party they’re after, and Dream does not disappoint. The 10-story tower contains the hotly anticipated fourth iteration of TAO restaurant (rmore of a nightclub than a fine dining establishment), NYC’s ultra-hip Beauty & Essex—the entrance for which night owls will find via a legitimate pawn shop off the refurbished alley—and an 11,000-square-foot, 500-person-capacity rooftop pool and lounge boasting unparalleled views of the Los Angeles skyline. That pool converts into a dance floor courtesy of a $300,000 hydraulic lift; no expenses spared. Other exclusive amenities include a 24-hour Gunnar Peterson-designed fitness center. Perhaps the name rings a bell? He’s trained Sophia Vergara, Angelina Jolie, Khloe Kardashian and now the Lakers, so guests are in good hands. The gym happens to be conveniently situated next door to a modelling agency (in case guests are looking for their next big break). Between the plethora of pretty people and boundless entertainment options, Dream lives up to its name—at least for a certain clientele. Location: What was once an undeniably downtrodden area is now a hip destination. This block located southwest of the congested Hollywood and Vine intersection is home to the hottest restaurants, bars and boutiques. And thanks to the refurbished alleyway accessed from the ground level of the hotel, getting around is quick and safe. TCL Grauman’s Chinese Theatre: Housing one of the world’s largest IMAX auditoriums (a 932-seater), the Chinese Theatre is still a great place to catch a movie, though most people come for the 200-plus handprints outside. Just prepare to battle the vast amounts of snap-happy tourists. Roscoe's House of Chicken & Waffles: This LA culinary institution is known for two things—fried chicken and waffles. This location is within walking distance of the hotel. Avenue: Occupying the same $110 million dollar complex as the hotel is this indoor/outdoor nightclub. The David Rockwell-designed, 4,000-square-foot space serves up world-class DJs and high-priced bottle service to its celebrity patrons. Iguana Vintage Clothing: Located around the corner from Dream is this mainstay vintage shop. Popular among the likes of Bruno Mars and Carmen Electra, Iguana has a treasure trove of clothing ranging in decade from the ‘20s to the ‘90s. Coffee Commissary: This industry hangout is a favorite for single-origin pour-overs and cold brews from roasters like Sightglass Coffee, Coava Coffee and Victrola Coffee Roasters. If you’re brave enough to head to Hollywood and Vine, perhaps caffeinate here first. Good for: With the hottest bars, nightclubs, and restaurants on its premises, this stereotypical Hollywood venue is a magnet for those striving to see and be seen. Young and hip seems to be a prerequisite for getting inside. Spend your days poolside Vegas style and nights in and out of the clubs. Then sleep it off in a room fit for a celebrity. Time Out tip: Dream really does have it all (well, everything except a spa, but at least there’s no resort fee). Look out for a few free items in the minibar, and take advantage of the fact that the all-new Lincoln Continental and the Lincoln Navigator are accessible free of charge between 8am and 8pm every day.